Here&apos;s our hit list for what&apos;s new and hot in Austin right now. Austin drew big chefs and even bigger food happenings in 2016. Indulge in culinary mastery by Mark Buley and Sam Hellman-Mas of Odd Duck, and Grae Nonas of Olamaie - named as 2015 James Beard Award Semifinalist for Rising Star of the Year. Austin&apos;s "culinary trifecta," James Beard Award semifinalists for 2015 include: Aaron Franklin of Franklin Barbecue, David Bull of Congress, and Bryce Gilmore of Barley Swine for Best Chef Southwest. Keep an eye out for the new Rock Rose entertainment district cropping up on the north side. Developers envisioned rooftop patio bars, restaurants and lots of new late-night options spanning two blocks. Local favorites like East Side King, Salvation Pizza, Sway and Lavaca Street Bar are among the Domain-area project&apos;s new tenants. New to the dining scene, Wu Chow is making waves with its fresh offerings traversing all eight styles of Chinese cuisine, as well as weekend dim sum service. A concept like no other, Blue Cat Café brings adoptable cats to a diner/coffee shop/pet supply store setting. Order a latte or try one of the many "cat dogs" (hot dogs with a variety of toppings), samiches or Tex-Mex dishes, while considering which fluffy friend you might adopt. The original Rainey Street hangout has moved to East Austin. Literally - they put the 19th century house-turned-bar on a truck and plopped it down across town. Visit Lustre Pearl East for their outdoor patio, ping-pong and amazing sandwiches and cocktails. Head to South Lamar and visit the Golden Goose where you&apos;ll find craft cocktails, a jukebox, shuffleboard and live music. Order the Disiac, made with fresh beet juice, gin, lime juice, sugar and soda. Another must-try is Geraldine&apos;s in Hotel Van Zandt. Plates sing with seasonal ingredients (think Texas pork with preserved grapefruit and charred kale), the cocktails are beyond creative and the stage lights up with local acts nightly. The Austin Visitor Center can help you plan a self-guided tour. Email or call 866-GO-AUSTIN. Wave sport enthusiasts, get ready to surf Austin at NLand Surf Park. The only inland surfing destination in North America will produce one, four and perfectly tubing six-foot waves every 60 seconds with a lengthy surfing experience of 35 seconds per wave. Golf fans will want to check out the PGA World Golf Championships, coming to Austin in March. The Austin Country Club will host and Dell will sponsor this major sporting event through 2019. The Live Music Capital of the World® was selected to host one of six stops on the Global X Games circuit for four years through 2016. Make plans to head to the Circuit of The Americas and watch competitions like Moto X Flat Track, Moto X Quarter Pipe and Big Air Doubles. 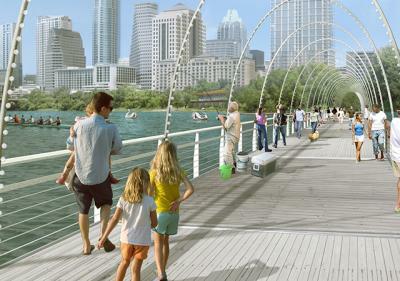 Running from Waterloo Park at 15th Street to Lady Bird Lake, Waller Creek (pictured above) has the potential to become Austin&apos;s vital green artery. The $500 million project envisions a community similar to San Antonio&apos;s Riverwalk, complete with retail shops, restaurants and residences. Developers hope to build this project on three acres near East Cesar Chavez and Red River streets, along the banks of Waller Creek. Staying in Austin just got really exciting. Downtown welcomed the new 1,012-room JW Marriott Austin (the largest hotel in Austin) and the 20-story Westin Austin Downtown, with its rooftop pool/bar and Stella San Jac restaurant, in 2015. The Hotel Van Zandt is a 16-story Kimpton property that hails from the Rainey Street District. Ask about their free wine hour and loaner bikes. The hybrid Hotel Indigo / Holiday Inn Express opened in 2016 on Ninth Street. Explore options and book your trip today at www.austintexas.org/places-to-stay.